Hallux valgus is a big toe deformity (a bony prominence) and is commonly called a bunion. Strictly speaking a bunion is a sac of fluid (a bursa) that forms over a bony prominence at the head of the 1st metatarsal the base of the big toe and should be called hallux valgus but typically it is called a bunion. 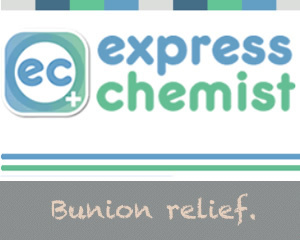 This bursa can become sore and inflamed. However in everyday language a bunion generally refers to the bony prominence and the deviation of the joint in this area. A bunion can be caused by excessive and abnormal pronation (internal rotation of the feet) which causes instability in the feet and especially in the 1st metatarsal area. 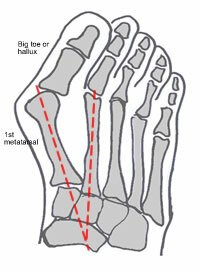 The big toe deviates towards the 2nd toe and may overlap the 2nd and sometimes the 3rd toe. Callus over the metatarsal heads underneath the foot. Often the 1st or the 2nd metatarsal heads have this callus. Sometimes a bursa (a sac of fluid) forms at the side or on the top of the joint. Shoes: badly fitting and restrictive shoes can bring on the development of bunions/hallux valgus. Shoes with a narrow or pointed toe box can press the toes together. Shoes with high heels can force more weight onto the ball of the foot and the toes. Treatment depends whether the discomfort or pain is being caused by shoes rubbing the skin over the big toe joint or if the 1st toe joint itself is painful. Change your footwear. Wear shoes without seams over the joint. A seam in the wrong place can cause misery as it does not allow the area to naturally stretch in the immediate area to accommodate the bony prominence. A seam can also rub on the skin and cause further misery. Wear shoes wide enough so the bony prominence does not rub. When purchasing shoes always walk swiftly around the shop. Do not just stand up, slightly move your feet and think the shoes are comfortable. Test the shoes out first in the shop instead of wasting your money on inappropriate shoes that you will eventually throw away. Avoid shoes with a narrow or pointed toe box. Pain Coming From 1st Toe Joint? Wear orthotics (functional insoles) in your shoes to change the way you walk to take the pressure off the 1st toe joint. Wear appropriate shoes. Orthotics cannot get rid of the deviation (ie change the look of the bunion) but can make an incredible difference to pain levels. Orthotics will also help to stop any further deterioration in the area. You can either purchase ready made insoles and orthotics, or have custom orthotics made to a specific prescription. Custom orthotics are far superior however ready made insoles are OK for some people and are an excellent temporary solution. Surgery to correct the deviation is a last resort when other measures have failed. Surgery can realign the toe and remove the bunion. There are a huge number of different procedures available depending on the surgeon and the severity of your condition. You must be realistic about the outcome of bunion surgery. If you have surgery it means you did not have a perfect foot before the operation and you will have to accept that you will not have a 100% perfect foot after surgery. What you should have, once everything is healed, is a significantly better foot than you had before, but perfect? No. Hopefully though all the pain and discomfort will have gone. Only consider surgery if orthotics and/or changing your footwear have failed to control your pain. Never consider surgery just because you don't like the look of your bunion. There are always risks and complications associated with surgery.